Did you know that August 30 is International Whale Shark Day? Whale sharks are the largest fishes on Earth, growing up to 18 meters (60 feet) long, but they feed mostly on tiny drifting animals such as copepods and, occasionally, small fish such as anchovies. To satisfy their immense appetites, whale sharks travel long distances to find dense swarms of prey. MBARI biological oceanographer John Ryan recently worked with biologists who have been tracking whale sharks in the Eastern Tropical Pacific Ocean. They discovered that whale sharks in this area spend most of their time cruising along fronts–the dynamic boundaries between warm and cold ocean waters. This study, recently published in the journal PLoS One, could help in the conservation of these endangered animals. In 2011 and 2012, a team of researchers from Ecuador and England attached satellite tracking tags to 27 whale sharks at Darwin's Arch, a remote location about 200 kilometers (125 miles) northwest of the main Galapagos archipelago, and about two degrees north of the equator. 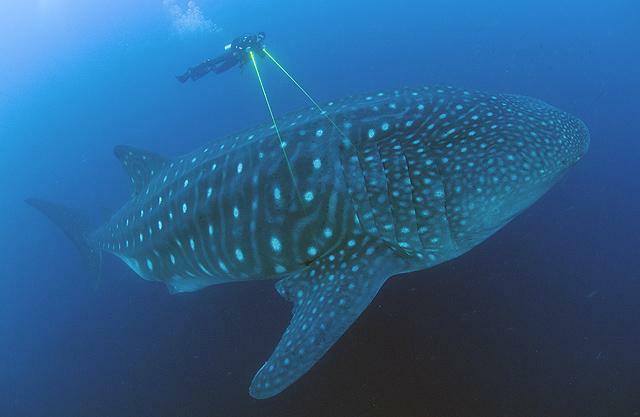 This was the first time whale sharks had been tagged in the Eastern Tropical Pacific. The tagged sharks spent the next four to six months traveling east and west from this location across a 4,000-kilometer expanse of ocean, mostly staying between the equator and five degrees north latitude. The researchers contacted Ryan to help them figure out how the whale-shark movements related to ocean conditions. This was a challenging task because ocean conditions are continually changing and whale sharks are always on the move. Sea-surface temperatures, routinely measured by satellites, can reveal the oceanic features that whale sharks encounter during their large-scale movements. Ryan analyzed day-to-day changes in sea-surface temperature across the entire Eastern Tropical Pacific for the months when the whale sharks were being tracked. Because the Equatorial Pacific is often cloudy, Ryan used a combination of infrared and microwave radiation data from satellites (microwave radiation can pass through clouds). When Ryan first looked at the whale-shark tracks in relation to the satellite data, he was struck by how consistent the tracks were. "The whale sharks could have ranged anywhere in the Eastern Tropical Pacific," he said, "but they were primarily following frontal boundaries between warm and cold water." Extending across the Eastern Pacific is a distinct boundary between warm water north of the equator and colder water to the south. This boundary is called the North Pacific Equatorial Upwelling Front. Ryan's analysis showed that whale sharks followed this front as if it was an open-ocean highway. When the front moved north and south in huge wave-like meanders, the whale sharks followed these meanders like semi trucks negotiating a winding mountain road. Darwin's Arch, the whale-shark tagging site, is located right in the middle of the equatorial front. This could explain why whale sharks are often seen in the area, but rarely hang around for very long. Ryan pointed out that the equatorial front is an environmental transition zone. "To the north of this zone, the water is warm and stable but there's not a lot of productivity," he explained. "To the south the water has high productivity, but is much colder." He continued, "Previous studies showed that plankton [small, drifting plants and animals] can accumulate in this transitional zone. So this zone may be a good place for whale sharks to find dense food patches, while not getting too chilled by cold water." Ryan also discovered that, when whale sharks approached the coasts of Central and South America, they followed fronts in these areas as well. Though less extensive than the equatorial front, these coastal fronts also form at boundaries between cold, high-productivity water and warm, less productive water. Whale sharks appear to head for these "secondary highways" in January or February, when the equatorial front typically weakens or disappears. In an interesting side note, almost all of the whale sharks tracked in this experiment appeared to be pregnant females. The one adult male that was tracked followed a similar path as the females. Two juvenile whale sharks that were tracked followed different paths, farther away from the equatorial front. In 2016, whale sharks were declared an endangered species, their numbers threatened by shark finning, entanglement in fishing gear, and boat collisions. But one of the biggest challenges in whale-shark conservation is simply coming up with good population estimates. By demonstrating that whale sharks can be found along fronts, this study will make it easier for marine biologists to estimate how many of these gentle giants are out there riding the rolling waves of the whale-shark highways.